Place eggs in 4-quart Dutch oven. Add cold water until it reaches 1 inch above eggs. Heat to boiling; remove from heat. Cover and let stand 18 minutes. Immediately cool eggs about 10 minutes in cold water to prevent further cooking. Tap egg to crack shell; roll egg between hands to loosen shell, then peel. Cut eggs lengthwise in half. Slip out yolks into medium bowl; reserve egg white halves. Mash yolks with fork. Stir in mayonnaise, seasoning, paprika and ground mustard until well blended. Stir in shrimp and crab. Spoon heaping teaspoonfuls of yolk mixture into egg white halves. Refrigerate at least 30 minutes before serving. Just before serving, sprinkle with bacon and parsley. 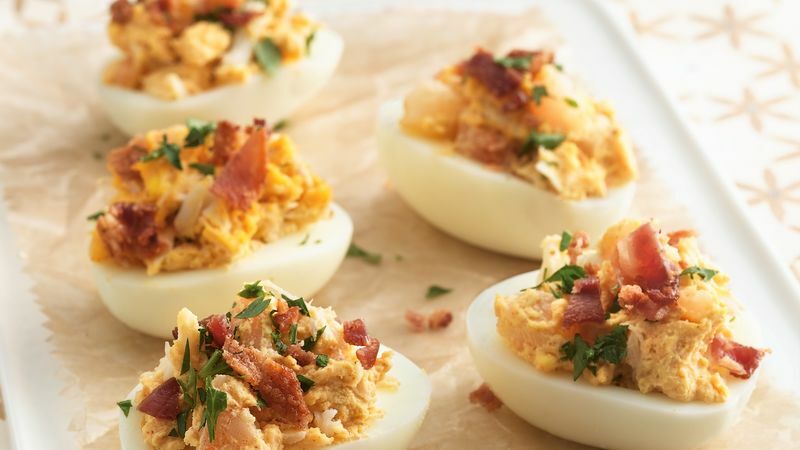 Prepare these stuffed eggs up to 24 hours ahead of time. Cover and refrigerate until serving time. Wait to add the bacon and parsley until just before serving. Very fresh eggs are difficult to peel. Plan ahead, and purchase eggs a week earlier so they’ll peel easily. Another trick is to peel eggs under cold running water.